If you are bringing an event to The Cockpit, you will need to fill in a technical questionnaire which we will send by email a few weeks before your show opens. The Cockpit technician supplied with a basic hire is there to support and advise your crew, and to look after The Cockpit's equipment and everyone's Health & Safety. You need to make sure you have enough people to load in, build your set, design and rig your lights, mix your sound, run your event, and load out. If you do not have enough people to do this let us know as soon as you can and we can supply extra crew when you need them. The Cockpit works in line with the TMA/BECTU Code of Conduct for get-ins, fit-ups and get-outs. We have a loading bay at the back of the building where you can unload into the workshop or directly into the auditorium. Please stop in at reception at the front of the building and ask for the car park key, then go past the front, around the corner onto Samford Street and it's the big steel gate on the left. We only have use of the small section of car park right alongside the back of the building, it's the unmarked section next to the tall loading bay doors, please don't park elsewhere in the car park as it doesn't belong to us and you may well get a parking ticket, do check the signage. After unloading/loading you can park on Church st which is metered parking bays until 6.30pm, free thereafter, also after 6.30pm you can park on the single yellow line on Gateforth Street or Samford Street. 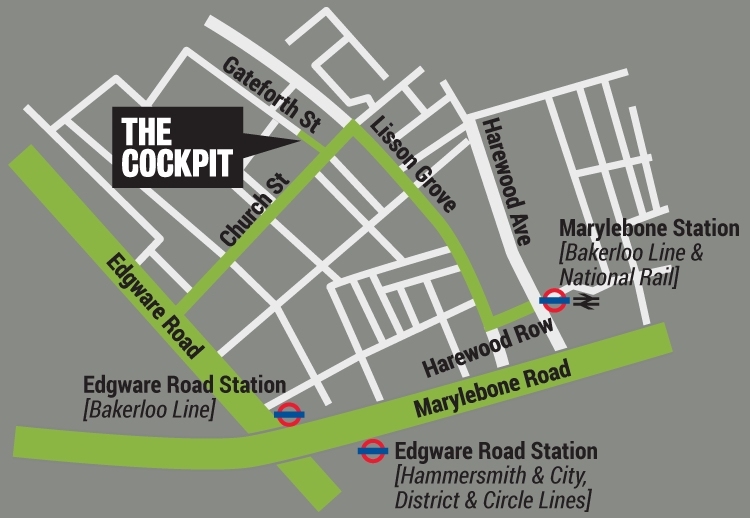 Discounted parking is available to Cockpit visitors at Q-park Church Street (for cars) or at Q-Park Marylebone (for vans). A discount of 10% is available on pre bookings, please visit the Church Street Q-Park website or the Marylebone Q-Park website entering 'cockpit' as the promo code.